People with mental illness account for 44% of the cigarette purchases in the United States, and they are less likely to quit than other smokers. High smoking rates among people with mental illness contribute to poorer physical health and shorter lifespans, generally 13 to 30 years shorter than the population as a whole. About 37% of men and 30% of women with mental illness smoke. The rate of smoking among whites with mental illness is 35%; blacks, 33.6%; and Hispanics, 27.2%, according to Mental Health America. While smoking rates are dropping in the U.S., a decade-long study that began in 2000 showed no consistent decrease for people with mental illness. In this podcast, C-HIT’s Colleen Shaddox explores the difficulties people with mental illness face in finding programs to help them quit smoking. “The quit rates are so low that physicians are kind of weary about getting in there and fighting the fight,” said Dr. Paul Sachs, director of Stamford Health’s Division of Pulmonary Medicine. Quit rates are low for all smokers, he added, but even lower for people with mental illness. Among the general population, less than 10% of smokers will succeed in quitting for six months in any given attempt. Jean-Marie Monroe-Lynch developed a smoking cessation program for people in Wheeler Clinic’s Adult Services Department, which serves the most seriously ill among the agency’s clients. Lynch, who directs the department, said 70% of the clients in it smoke. With support, including group counseling, nicotine gum and referrals for sessions of acupuncture and exercise, 15% of those who signed up managed to quit for a week—a high enough success rate that Lynch wants to expand it. Even for those who did not remain smoke-free, there was a benefit, as smokers typically go through multiple attempts before finally quitting. “Some people didn’t successfully quit, but it gave them that thought process,” she said. 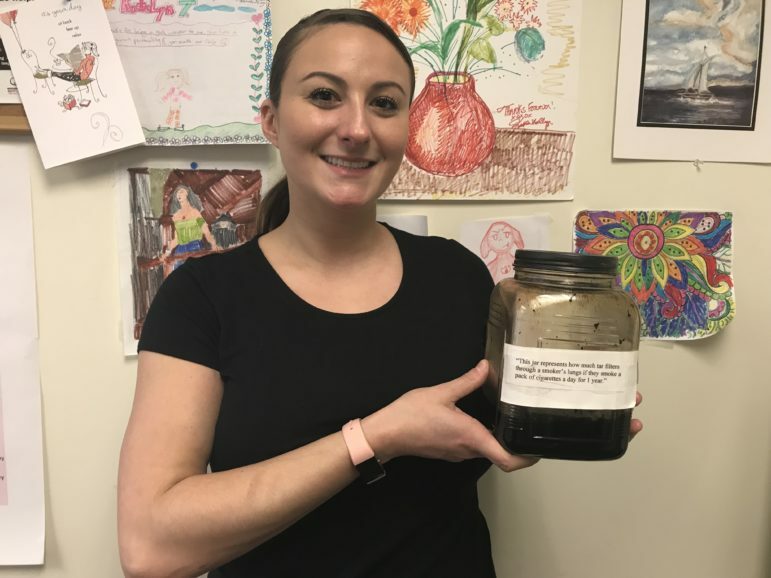 Katelyn Trauger, a social worker at Fellowship Place, holds a jar that she says represents the amount of tar a smoker’s lungs accumulate in a year.